In this summary of eBay sales by Paul Cassell (this time from Tuesday evening), there were a lot of high mileage cars traded. Mercedes-Benz are having an interesting time at the moment, with a mass recall in the same year as the launch of some very exciting cars (the CLS springs to mind). However, it is the C-Class that is Mercedes’ major seller. A silver 2001/51 C220CDi Avantgarde estate with 99,000 miles, one key and FSH made £11,000. There is probably no-one in the country who hasn’t heard of MG Rover’s demise, and there will be many people wondering how the second hand prices will hold up. A MG TF, possibly the MGR car with the best chance of holding its value, was sold for a slightly low £8,000. 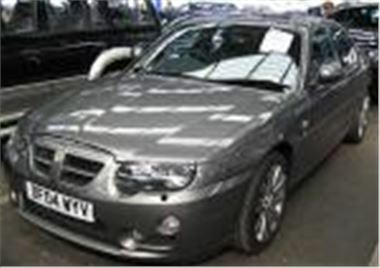 It was a 135bhp version with 16,500miles on a 2002/52 plate and in good condition. But Car Giant are selling one year old examples with half the mileage for only £1,500 more. If you needed to deliver stock to remote places you had a couple of options today. A commercial green SWB 2001Y Land Rover Freelander Td4 with two previous owners and 110,000 miles sold for £7,001 whilst a commercial white 93K Defender 90 diesel with 134,000 miles, a year’s ticket and a bit of surface rust sold for £2,851. Amongst the larger cars, a 2002/52 silver Vauxhall Omega 2.2DTi CD with 65,000 miles lost the best part of £14,000 in less than 3 years selling for £6,600 after the bidding started with no reserve. And a large BMW was sold again this week. A 1997R 735i with all the toys, 105,000 miles and a private plate made £4,800. If you had around £4,400 to spend on transporting the family, you could have bought a clean lilac 85,000 mile 1997R Chrysler Voyager 2.4 auto (LHD and an US import), a green 160,000 mile 2000V Volvo V70 2.4 SE in good nick and 50k of those miles in the first year (with £50 change) or a white 102,000 1999V Vauxhall Zafira 1.6 Comfort with £200 to spare. £3,300 was enough for a Vauxhall Astra 2.0Di CD with 90k and in clean condition but a dour shade of navy. There was also a rare Fiat Marea Weekend in black. This 5 cylinder diesel 2.4HLX was honest with almost a year’s ticket, a new timing belt and 85,000miles making £2,300. Peugeot’s pretty 106, this time an example in 1.1 XL Independence spec, on a 1997R but having covered only 25k miles, and in good condition sold for £1,700. And a VW seller was using VW’s reputation to sell a green 1.8CL auto 5 door hatch. The 1996P had 5 months MOT and by the sellers admission was cosmetically scruffy. It had covered 63,000 miles and sold for £1,200. An apparently unmolested white Ford Fiesta XR2i with ‘no silly alarms’ and the original Ford head unit, an oddly precise 94,001 miles and 4 months ticket made £820. 6 cars with MOT remaining sold for less than or around £500. A green 127,000 miles Renault Laguna 2.0 RXE with 8 months MOT sold for £500. £100 less would have bought you a scruffy VW Golf 1.6 Driver with the same length of MOT and ‘only’ 95k miles. Almost a year’s MOT was available on two cars under £400. A 94M Rover 218SLD in white with 100,000 miles was £10 shy of £400 whilst a BMW 316 with 74k miles and 11 months ticket but on a 1987D made £265. And a Renault 19 1.4TS Energy on a 1989G with 7 months ticket sold for £149 whilst £120 was enough for a 1988E Volvo 740 2.3 SE with 3 months ticket and 203,000 miles. This week someone has photographed a beast of a car by the Thames near Putney Bridge in an attempt to attract people to bid in excess of £90,000 on eBay. The car in question is a 1994 550bhp Aston Martin Vantage with only 1200 miles. It is LHD and in silver. And a lot of money to spend on eBay.